The Google News Initiative is working with newsrooms to provide top searched issues, related searches and questions. To make it easier for journalists to find this data, we’ve launched Google Trends Australian Federal Election 2019 page, which includes state-level data on the top issues searched in each region, such as the economy, education and healthcare (to name a few). All the charts from the Google Trends pages are embeddable on any site and will continue to update even after they’re placed on your site. Google has also supported First Draft to tackle misinformation at a global level since 2015, and together we’re committed to stemming the flow of misinformation and disinformation by working with news organisations, especially ahead of elections. With support from the Google News Initiative, First Draft this week launched its first bureau in the Asia-Pacific region to assist journalists and publishers unearth and expose misleading, false and untrue claims. Led by Anne Kruger, the Bureau will be based at the Centre for Media Transition at the University of Technology Sydney and will train and work with professional journalists and student-reporters across the country to develop the skills and expertise to reveal disinformation. First Draft will work alongside the Walkley Foundation, which is leading a training effort to educate up to 4,000 journalists and journalism students across Australia and New Zealand in digital skills and verification in 2019. As the Election draws closer, reporters want to understand what people - right across Australia - care about. We look forward to working with them to surface insights to help tell those stories. Explore more Google Trends at google.com/trends and learn more about the Google News Initiative at g.co/newsinitiative. And stay tuned for more updates on the election from Google! As Australians head to the ballot box in coming weeks, they are searching for information on policies, parties and candidates. We’re working with newsrooms to help journalists access these trends and explore what voters care about this election. This isn’t about voting intentions, but it does provide unique insights into what people are searching for and what they care about at a local level. Here’s how we’re helping journalists to use these trends tools. Competition at Sydney Olympic Park. FIRST Robotics aims to inspire young people to become science and technology leaders, by engaging them in programs that build science, engineering and technology skills. Students work together to build robots that could complete particular challenges. As part of the program, students receive help from mentors, including industry experts, engineers, school teachers, university students, lecturers, FIRST alumni and others. A survey of past participants shows those that took part are more likely to study science, technology, engineering or mathematics at university and over 75 per cent of FIRST alumni are now studying or working in a STEM field - skills that are important for Australia's future workforce (Alphabeta). Google has long supported FIRST and together with Macquarie University we were pleased to help bring the competition to Australia. This year, we also hosted a breakfast for Women in FIRST to build connections with mentors and be inspired to continue their STEM journey. FIRST teaches students the computational skills they will need for the future - whether they end up working in computer science, banking, medicine, agriculture or any number of other fields being transformed by technology. More than STEM skills, the program also develops leadership, resilience, confidence and teamwork - all vital for building an innovation generation. Find out more here. Building a robot is pretty remarkable, all the more when it’s teams of high school students piecing it together in just 6 weeks to compete at an international competition. Last month, more than 2,000 students from Australia, China, Vietnam, New Zealand, South Africa, Chinese Taipei, India, Indonesia, USA and Singapore took part in the FIRST Regional Robotics Competition at Sydney Olympic Park. Starting today, when you search on your phone for things like “events near me” or “free concert,” new features will give Aussies personal recommendations, along with more information about events that may interest you. Whether you’re in Sydney, Hobart or Darwin, you’ll find a list of events from a variety of sites, including Ticketmaster, Eventbrite, Timeout, Concrete Playground – and also key information about the event, right on Search. Tap any event you’re interested in and you’ll get an overview of things like time, location, ticketing providers and other information that will help you decide whether to attend. If you’re ready to take the plunge, you can follow the links to buy tickets from the provider of your choice. If you’re still deciding, you can head to the event webpages for more information. We also make it easy to save events and share with others, so you can plan as you go. With these new features, you can easily discover events based on your interests. While browsing events, you can tap the “For You” tab to get personalised ideas for things to do near you. You’ll also see trending and popular events in your area to keep you in the loop on the hottest happenings. You’ll find events from across the web – from meetup and concert sites to individual event listings from organisations and brands you love. We’ve made it easy for sites to mark up their event listings to appear in this experience, with new listings updated quickly. Event sites can follow these guidelines to ensure events are discoverable. Try it out today to find the perfect dog meetup, local festival or must-see concert for you. On the hunt for activities to fill your autumn calendar? Whether it’s Easter shows, art exhibitions or concerts, we’re making it even easier to find events in Search. Businesses and individuals learned how to grow their presence online and find new customers, and individuals at all stages of the digital journey picked up new skills. Grow with Google aims to give all Australians access to digital skills training, both online and in-person, to help them make the most of the web. It includes a new online learning hub accessible from anywhere, on any device, with hundreds of handy training modules. Front row: Hannah Frank (Google Australia), Michael Healy MP, Richard Flanagan (Google Australia), Anna Fredericks (James Cook University), Debbie-Anne Bender (CEO, Cairns Chamber of Commerce), Nick Loukas (President, Cairns Chamber of Commerce) Thanks to the Tourism and Investment Queensland (TIQ) and the Cairns Chamber of Commerce for working with us to help deliver these important skills for regional communities. Grow with Google aims to create opportunity for all Australians to grow their skills, careers, and businesses with free tools, training, and events. Find events near you at: g.co/GrowAustralia. Far North Queenslanders had the opportunity to learn new digital skills today, as Grow with Google came to the region for the first time. More than 300 small businesses, students, community organisations and individuals attended workshops at the Cairns Convention Centre today. Queensland Member for Cairns, Michael Healy MP formally opened the event and spoke about the importance of digital skills to the jobs of the future in regional communities. - or a crowd-pleaser playlist for that end-of-semester party? Need a great binge-worthy series for Easter break like Cobra Kai, Impulse or Wayne? Could you use a physics boost from undergraduate and maths enthusiast Toby? We’ve got you covered! Last year, we introduced the new YouTube Music and YouTube Premium subscription plans to help users get more from their YouTube experience. YouTube Music is a music streaming service with official albums, playlists and singles, as well as a vast catalogue of music videos, remixes, live performances, covers and more — all with ad-free, background and offline access. YouTube Premium extends that ad-free experience across all of YouTube, and includes access to YouTube Originals. 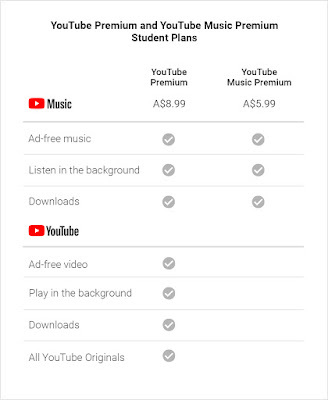 Student plans are available for YouTube Music Premium for $5.99 and YouTube Premium for $8.99. Student plans are currently available to all full-time higher education students at a government registered Australian or New Zealand education provider in Australia or New Zealand. Click here to learn more about eligibility requirements. 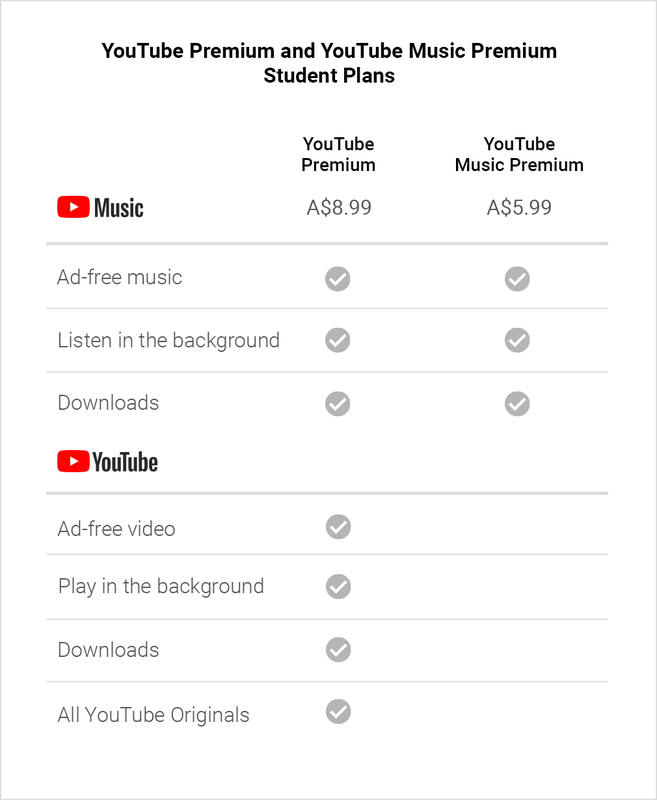 Today, we’re introducing new student plans for YouTube Music and YouTube Premium, giving eligible higher education students discounted access to a world of music, original series and movies — all ad-free and at a wallet-friendly price. Looking for some lo-fi to help you concentrate while studying for exams - check out our Chill Beats Bliss - or a crowd-pleaser playlist for that end-of-semester party? Need a great binge-worthy series for Easter break like Cobra Kai, Impulse or Wayne? Could you use a physics boost from undergraduate and maths enthusiast Toby? We’ve got you covered! , aimed at strengthening our support of digital innovation and new business models in news organisations. Through our work and partnership with publishers, it’s clear that reader revenue is key to their financial stability. We want to support innovators in this space—those who are pioneering approaches that involve everything from granting digital currency to subscription-based membership models. Crikey (Private Media) - Crikey's business model is already geared towards reader revenue, with over 90% of its revenue coming from individual subscribers. It aims to expand and diversify its pool of reader revenue by developing an innovative, user-friendly group subscription offering. Women's Agenda (Agenda Media Pty Ltd) - The Women's Agenda Extra platform is offering loyal readers a little 'extra' through a simple membership platform, featuring core components including regular deep dives on key news events; opportunities for members to discuss stories with journalists and editors; a database of female expert sources. Guardian News and Media Australia (GNM Australia Pty Ltd) - Guardian Australia will develop, prototype and user test a technology solution that will allow the timed surfacing of rich media during audio playback on mobile. This will enhance the user experience when listening to audio content and make it easier for listeners to make financial contributions to publishers. Mamamia (Mamamia.com.au Pty Ltd) - Mamamia is developing a membership proposition that caters for different audiences’ content preferences. Building on existing high audience engagement, it aims to diversify both revenue and traffic sources for the organisation. Community Broadcasting Association of Australia - The association will pilot a fundraising platform for Australia’s community broadcasting sector. Donations are a key growth area for income generation in community broadcasting and this project will develop fundraising technology for the sector. Within two months of opening up the Innovation Challenge, we received 215 applications from 18 countries. After a rigorous review, a round of interviews and a thorough jury selection process, we ended up providing support to 23 projects in 14 countries—amounting to a total of $3.2 million. When we called for applications, we listed four criteria: impact, feasibility, innovation and inspiration. The winners demonstrated a combination of each. Thank you to every organisation who applied. There will be a second round of the APAC GNI Innovation Challenge later this year, and we encourage you all to re-apply. Watch out for details on our website. Last year, we launched the Google News Initiative (GNI) Asia Pacific Innovation Challenge, aimed at strengthening our support of digital innovation and new business models in news organisations.